This now highly sought after CD was limited to just 500 numbered copies, and sold on John Foxx and Louis Gordon's 1998 UK tour. The Subterranean Omnidelic Exotour expands on the original Exotour EP, making a full twelve-track album of powerful electronic song reworkings. In addition to the new versions of older tracks from the likes of Metamatic and Systems of Romance, this album also contained alternative versions of more recent material, from Foxx and Gordon's Shifting City album. 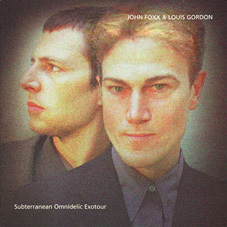 The Subterranean Omnidelic Exotour is no longer available, although it was later made available, with some tracks remixed, on the Golden Section Tour/Omnidelic Exotour double album.